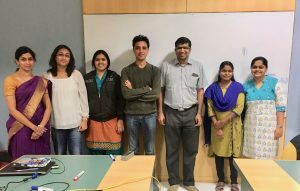 We are conducting a one day workshop to collate and present research work by research scholars at the Web Sciences lab, IIIT Bangalore. Research Scholars will present their work, discuss ideas, share problems encountered, retrospect and provide updates on their progress. The abstracts of various talks are given below. Abstract: Data available on public domain especially though open data initiatives such as data.gov, data.gov.in, data.gov.uk publish useful information on various aspects of government policies and administration. One could derive immense insights by semantically integrating such datasets across various domains. Semantic Integration involves extraction of common domains or themes that explain a collection of datasets by identifying unique resources for data values and relations amongst rows of data across these datasets using known or custom vocabularies and knowledge bases. The natural taxonomy and classification of the entities, instances and properties in the vocabularies allow for extraction of themes relevant to the datasets. Multiple research efforts have addressed the problem of semantic annotation of web tables and csv tables, which mainly involves interpreting tabular data by linking them to relevant vocabularies, however they have not focussed on the problem of semantic integration of tables. Linking Government Data is an active research interest. The current process to semantically link such datasets is largely manual and involves manual identification of vocabularies, classes and properties for each dataset, creating templates which will then automate the process of mapping the data to the identified vocabularies. Our work presents two models, 1) the generation of semantically linked data for the open datasets using vocabularies from LOD cloud such as Dbpedia, YAGO, Schema.org, UMBEL etc and 2) representing the data in an intuitive home-grown Knowledge Representation Framework called MWF (Many Worlds on a Frame), a framework loosely modelled on Kripke Semantics. MWF allows for rich representation of data across two aspects – the type hierarchy(is-a) relationship and the containment hierarchy(is-in) relationship supported by roles and associations to transform the open datasets into a web of semantically interlinked themes and their associations. Abstract:Text summarization is an active research area among Natural Language Processing research community. The community have been developed diverse paradigms for generating summary from long documents, even-though there is minimal effort on creating summary from large collection of short and noisy documents. Here, the short documents refers to user generated social media activity messages or any short reports which are generated as part of any closed domain. The proposed research aims to (semi-) automate the process of summary generation from a given set of short documents with more emphasis on the semantics of the document content. The research is initiated with a completely unsupervised techniques. The entire document collection is represented as an undirected graph of key phrases and later the graph clustering, graph centrality based measures and Markov Random Field based factor computation techniques are used to glean the important information. Further simple natural language generation techniques and natural language specific heuristics are applied to generate the candidate sentences for the final summary. During the open discussion, all the participants will briefly share their individual views and comments on whether research pursuits have changed their approach in life towards achieving their passions or goals, and if yes, share their experiences.